You are located on the beach side of Elizabeth Drive, 2 mins walk from the beach and bike track. Water glimpses and cool sea breezes from the large undercover entertainers balcony, fully equiped with large BBQ and outdoor seating. Walk to Huskisson cafes and vincentia shops. Fully Renovated Modern Beachcomber style home. Ideal easy care for two families. Upstairs is 1 KING bedroom, 1 Queen bedrooms and bunk room that sleeps 4 kids - (all bunks have safety rails). Large Lounge / dining room, fully equipped kitchen and Brand new bathroom. Downstairs is a large TV / Rumpus room with 1 Queen b edroom and 1 bunk Bedrooms and Laundry / Second bath room. We have a porta cot, highchair and safety gates for those of you with toddlers. We also have a second cot available if requested. Please bring your own linen. We do not supply. The front yard is large enough to easily park a car with boat trailer (or two). Jervis Bay has the most beautiful beaches and the whitest sand in the world. You are a short stroll from where Moona Moona creek meets the ocean, which is a fantastic place for younger children to play and swim safely. You can enjoy swimming, fishing, diving and kayaking almost at your back door. Dolphin and whale watching cruises depart daily from Huskisson, which 1km north of Vincentia. There are plenty of places to eat out and shop within the local area. Bushwalking on the 'Whitesands Walk' thru to Hyams beach is a great way to view the spectacular coast line. Once you have had a holiday here, you'll be back. The yard is fully fenced, so you are welcome to bring any pet that stays outside. (They can sleep in the laundry) Please bring your pets bedding and bowls. There is a surcharge of $75 per week for pets, and you are expected to leave the yard in good condition, or an additional cleaning fee will be charged. Extra large undercover deck off kitchen with cool sea breezes. Great house, almost on beach. Beach and Moona moona creek very safe for children. Bike track runs right along beach at back of house. Very comfortable family home. 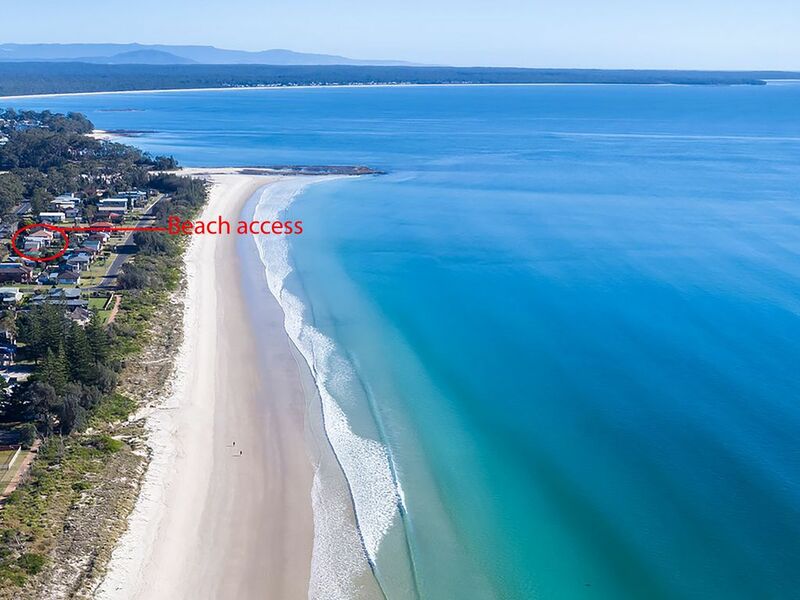 Short walk to either Huskisson or Vincentia for cafes and restaurants , tours, souvenirs and grocery shopping. Great spot for a family holiday. House had loads of handy essentials available. Melissa was very easy to deal with and would definitely stay again. When we arrived we were amazed at how big, beautiful and clean the house is. We stayed in complete comfort on our holiday. Also, great communication with the own Melissa who was so helpful and made sure our stay was comfortable. We look forward to coming back. Thank you so much. Spacious home with enough room for 10-12 people. Fully equipped kitchen and toddler security gates. It would have been good to have bath mats in the bathrooms. Overall nice relaxing stay. Second time at this property. Great location, 2 minutes from the beach. Ideal for families. Great backyard. Has everything you could need. Elizabeth Street was a perfect property for our family holiday with our family of 11 being 6 adults and 5 grandchildren. It was close to the beautiful beach, the vibrant buzz of Huskisson, interesting trips to the National Park and the lovely beaches there. A very happy realxed time with all we needed in the house and nearby. The yard is fully fenced, so you are welcome to bring any pet that stays outside. They can sleep in the laundry Please bring your pets bedding and bowls.